The vessel was arrested, the captain fined 50,000 kroner. 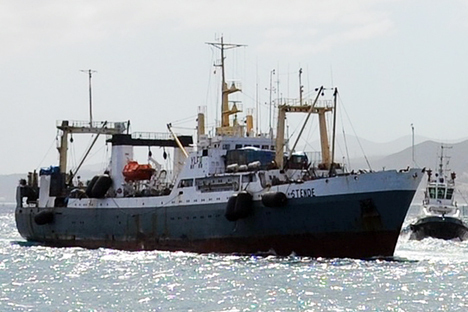 A Russian sea trawler has been detained in Norwegian waters for violating fishing rules. The Dolgoshchelye trawler (registered at the port of Murmansk) was detained for having thrown caught fish overboard, which is prohibited under Norwegian laws, said Alexander Chumakov, general director of OOO Persei, the company that owns the trawler. The Dolgoshchelye was detained a week ago, but the company has only now made the announcement. "The vessel was arrested, the captain fined 50,000 kroner, and the Persei company nearly 1.2 million kroner. We will now protest, we will hire a lawyer," Chumakov said. Currently, the company is getting ready to pay a deposit for the vessel so as to get the Dolgoshchelye released from the Norwegian port of Vardo, he said. The trawler's crew is allowed to go ashore, there is no problem with food and water supply aboard the vessel, the owner said.